Looking for a universally special corporate gift? Orrefors has a wide variety of glass gift items, many that can be optionally custom etched. Orrefors Kosta Boda, Swedish glass maker, is associated with art glass and contemporary clear crystal products of high quality design. Since 1726, Orrefors and Kosta Boda products are created in close collaboration with skilled craftsmen and are always appropriate for awards, gifts and variety of occasions. Click here to download the 2015 Orrefors and Kosta Boda Corporate Catalog. Abour Orrefors: The Swedish glass industry was born about 250 years ago, not far from Orrefors. In the summer of 1742 the first glassworks, warehouse, potash furnace and smithy were inaugurated in what is now Kosta. For more than 260 years, Orrefors has won thousands of design and glassmaking awards, and have been collected by individuals and museums and showcased in exhibits and public installations the world over. In the 1980s Orrefors decided that the glass of designers who had died or left the glass-works would no longer be produced. About CEO promos: Sister company to CEOgolfshop.com, a 100% Women-owned Florida business since 2004. CEO promos specializes in quality custom products, including luxury men’s apparel and one of a kind art gifts. From private label to top luxury brands, we manufacture or source virtually anything executives and high net worth individuals need. 3D Merchant Services donated the white Yet Tundra 35 to JA World Uncorked 2015 silent auction. Not every company has the perfect product or service to donate for charity events, but that doesn’t mean you can’t make a long lasting impression. Yeti Coolers are so durable, they’re expected to last for generations. Whether you choose to donate blank, or add your custom logo, this item will get talked about for years. Yeti owners will share where they got their cooler from over and over again, spreading the word about the charity and your company. 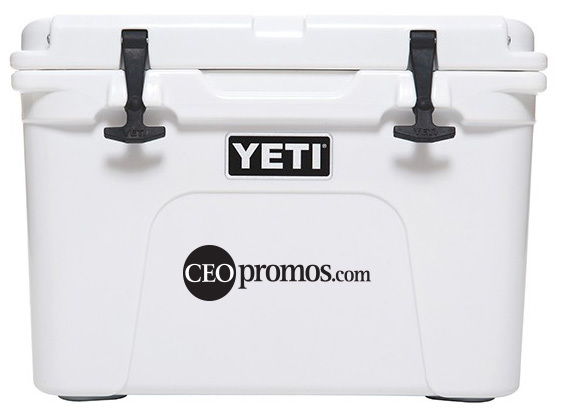 CEOpromos offers multiple methods to customize Yeti coolers permanently with company logos, plane tail numbers, yacht names and more. 3D Merchant Services donated the Yet Tundra 35 to the JA World Uncorked silent auction, a $299 value. Looking for a great deal on a Yeti Cooler? Due to manufacturer price restrictions, you won’t find them at a discount by any approved reseller. However, by partnering with one company for all your promotional product and gift giving needs, you’re more likely to get extra ‘freebies’ when you need them. In this case, we procured extra Yeti goodies at no additional cost. If you want high value charity gift ideas that will last for decades or longer, contact CEOpromos. The annual JA World Uncorked returns for its fifth year on January 24, 2015. The culinary showcase, presented by Premier Beverage and hosted by chairs Bob and Susan Drinon and Renée Korbel Quinn with Junior Achievement’s Circle of Wise Women, will give guests a chance to mingle with some of South Florida’s top chefs, experience their culinary creations and support local education through Junior Achievement South Florida. About Junior Achievement South Florida: 501c3 nonprofit that reached over 48,000 students in Broward and south Palm Beach County students during the 2013-2014 school year. It’s core purpose is to inspire and prepare youth to succeed in a global economy. JA’s Educational Focus Centers around Entrepreneurship, Workplace readiness and Financial Literacy. About 3D Merchant Services: Delivers flexible, scalable, payment processing solutions to software companies and merchants, so they can competitively service their customers, mitigate risks of accepting credit cards and other payment types, and improve EBITDA. Core products include payment gateway virtual terminal, and electronic bill presentment & payment. About CEO promos: Sister company to CEOgolfshop.com, a 100% Women-owned Florida business since 2004. CEO promos specializes in quality custom products, including luxury men’s apparel and one of a kind art gifts. From private label to top luxury brands, we manufacture or source virtually anything executives and high net worth individuals need. Contact 800-CEO-1899. Customize a Yeti 20 oz Rambler with logo text. Yeti Rambler 30 oz, Cold or hot liquids, this tumbler is the best ever made. MSRP $30 blank. A friend recently described Yeti as the Rolls-Royce of coolers. The new insulated Yet Rambler tumbler in 20 and 30 ounce sizes are no exception to their infamous quality. I added some ice, room temperature water, and headed to the tennis court, Sunday, an 80 degree scorcher. The ice never melted. When I got home, I pulled the lid off and added a mixture of tap water and room temperature gatorade, drank some and left it on the counter. When I discovered it there 16 more hours later, even though the ice was melted, I had to try it. Yep, sure enough it was still ice cold! Yeti keeps cold stuff cold much longer, it doesn’t sweat and your hand won’t get cold holding it. 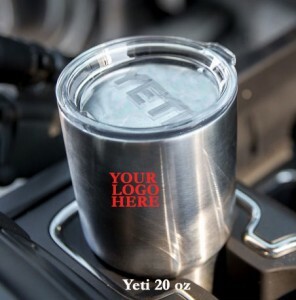 Yeti keeps hot stuff hotter for longer- users report hot coffee all day! Your hands won’t get hot from holding either. Pour in a cold beer and it will be cold to the last drop- no ice needed. Colors: Technically, more than one color can be produced, but we recommend one high contrast color, such as black, for the best value. Where to buy custom Yeti and Tervis insulated tumblers: Call CEOpromos & CEOgolfshop at 800-CEO-1899, 954-942-7747.